This article is about the 1986 film. For the 2010 film, see The Whistleblower. 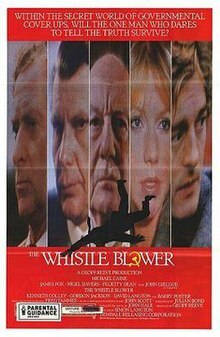 The Whistle Blower is a 1986 British spy thriller film directed by Simon Langton and starring Michael Caine, James Fox, Nigel Havers, Felicity Dean, John Gielgud, Kenneth Colley, Gordon Jackson, David Langton, and Barry Foster. It is based on the novel of the same name by John Hale. Frank Jones (Caine) is a retired British naval officer and Korean War veteran, who is now a businessman. His bright but naive and idealistic son, Robert (Nigel Havers), works as a linguist at GCHQ, the top secret British intelligence listening station, using his love of Russian to listen to various pieces of communication on the other side of the Iron Curtain. The film opens on Remembrance Day in Whitehall, as the war veterans line up to walk past the Cenotaph (a monument to fallen soldiers), then moves back to a conversation between Frank and his son at Robert's flat some months earlier, where Robert tells Frank that strange things are happening at GCHQ, and he's planning on leaving and marrying an older woman called Cynthia (Felicity Dean) with whom he's fallen in love. Robert says a Soviet mole was found, and that security is all over the place encouraging people to rat on each other. The higher ups seem convinced that if they don't do something, their American friends in the CIA will stop working with them. Frank isn't thrilled over the marriage plans, and he tells his son before he leaves that it's unlikely anything off key can be happening in the agency. It's obvious that Frank loves his son deeply and wants him to be happy, whatever he may choose for himself. The scene cuts to a room in British Intelligence, where operatives including Bruce (Gordon Jackson) are listening to a tape recording of the conversation between Frank and his son. A few days later, police tell Frank that Robert has died in a fall in an apparent suicide, and a verdict of accidental death is recorded. However, in the midst of his grief, Frank is puzzled by the circumstances of his son's death and decides to use his old skills to conduct his own investigation. He approaches his friend Charles Greig (Barry Foster), who had joined MI6 after his service in the navy. Greig agrees to make discreet enquiries on his part. Returning to Robert's flat, Frank is confronted by radical socialist journalist Bill Pickett (Kenneth Colley), who had arranged to meet Robert to discuss the problems at British Intelligence, but Frank rejects his investigative approaches. Frank is also told that he is in the running for a large government contract for his firm, with an implicit undertone that he not make waves about his son's death. The rest of the film digs into an examination of the British establishment which is disturbing and ugly, and make Frank question his view of the country he loves. There are strong echoes of the Anthony Blunt case and the Cambridge spies. Frank, discreetly pursued by British Intelligence, finds men who easily consider others expendable if their ideas of class and privilege are endangered. Pickett is also killed in mysterious circumstances in a traffic accident on his way to East Grinstead, having found out the name of the man who Robert wished him to meet before meeting Frank. Frank is then approached by Robert's best friend and fellow British intelligence linguist Allen Goodburn (Andrew Hawkins) at Robert's funeral. Frank learns from Goodburn that it was his good friend Grieg who had approached him as to Robert's feelings for the service. Frank gets Grieg drunk and gets him to confess that he was at Robert's flat the night Robert died. Greig admits he was there as the service had something on him, but that his job was only to leave the door open and let "others" heavy-hand Robert, not kill him. he also reveals the name of the mole as Sir Adrian Chapple (John Gielgud). Leaving Grieg in his drunken stupor, Frank is picked up by British Intelligence and driven to a country house, where he is confronted by Secretary to the Cabinet (David Langton) and Lord (James Fox). They explain to him that his son was out of control, and was killed as part of a plan to mislead the Americans as to the extent of the depth of Russian intelligence's operatives inside British operations, in the hope that they could continue to gain intelligence from the CIA. They have presently left the higher Russian operative in place, until they can assess the extent of the damage caused. They advise Frank that should he go public with any of this information, he and/or Robert's girlfriend Cynthia and her daughter will be killed or at least restrained. The film returns to the present, and the Remembrance Day parade. Frank confronts Chapple at his home in Whitehall, and gets him to confess to being a spy for Russia. Frank orders him to sign a full confession, which he does, but as Frank reads it, Chapple produces a gun and demands its return. Frank grabs the gun, which goes off and kills Chapple — leaving his signed confession to act as a suicide note and put Frank in the clear. He returns to the Remembrance Day parade. The closing credits roll to an ambulance attending the death of Chapple, as Frank walks past the Cenotaph up Whitehall. The film was largely shot on location in Cheltenham, Gloucestershire; home of GCHQ, which forms the premise of the film. Cheltenham Racecourse, Cheltenham Spa station, Cheltenham Crematorium and the Promenade feature in the film. The London 'tube' murder scene was actually filmed on British Rail's Waterloo & City Line (which at the time did not run on Saturday afternoons or Sundays so was an accessible location for filming). Though it was given a limited release, the film opened to positive reviews. It has an approval rating of 86% on Rotten Tomatoes. ^ "The Whistle Blower". Box Office Mojo. IMDb.com Inc. Retrieved 28 July 2015. This page was last edited on 30 March 2019, at 03:58 (UTC).